"...With all the warmth and comfort of a big bedtime storybook!" It�s hard to concentrate when there�s a rumbly in your tumbly. No one knows that better than Disney�s most lovable bear, Winnie the Pooh! 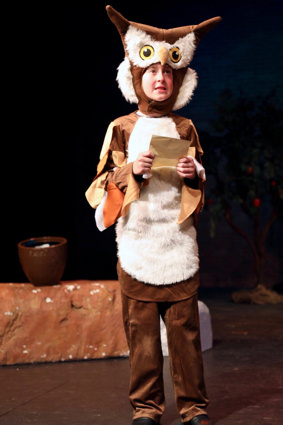 The popular �KIDS� edition, which was recently produced in a sweet-as-honey staging by Morgan-Wixson Theatre�s Youth Education/Entertainment Series Program (Y.E.S.) in Santa Monica, ran earlier this month from February 2nd through the 17th to a very excited and perpetually packed house. 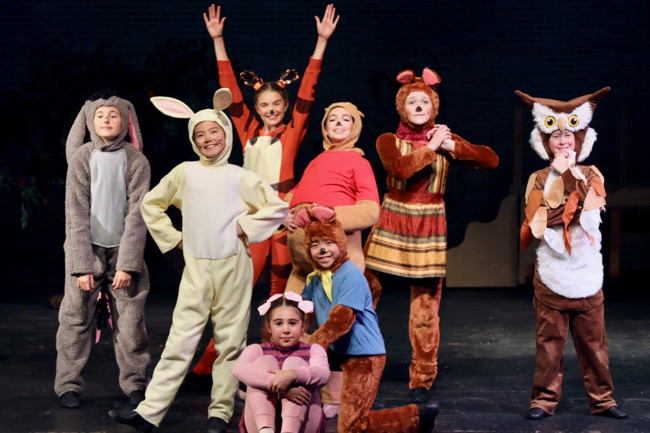 Directed by Eve Keller, with Choreography by Eileen Cherry O�Donnell and musically directed by Natalie Khan, this �Winnie� version is a blend of the classic tales of cuddly old Pooh Bear himself and friends, by A.A. Milne and Disney�s animated version. The musical�s book is by Cheryl Davis with music and lyrics by familiar Disney composers, Richard M. Sherman and Robert B. Sherman, along with Robert Lopez, Kristen Anderson-Lopez and Will Van Dyke. Many of the residents we know and love from the Hundred Acre Wood come alive in story-book fashion and in vivid colors � Christopher Robin, Eeyore, Piglet, Owl, Kanga, Roo, Rabbit, and of course Tigger � and they�re facing existential global problems such as lost tails (Eeyore), honey deprivation (Pooh), and terrorism from the forest creature, the �Backson� (thanks for nothin�, Owl). If you haven�t heard of the Hundred Acre Wood, it�s generally accepted by most Pooh fans as the entire world of Winnie the Pooh, the forest and all the places it contains. For the most part, Owl�s treehouse home is centered right in the middle, and is usually the first place Pooh runs when he has a problem. 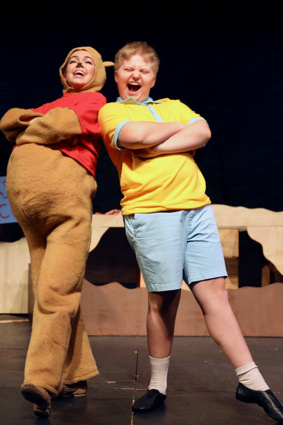 Produced by Teri Senior and Lara Schrader, Disney�s Winnie the Pooh KIDS is a musical for young performers, and packs a lot into a delightful but short two acts, as Pooh Bear and his friends search for their friend, Christopher Robin. A note he left has them believing he has been captured by a horrible creature called the Backson, and they plan to trap the Backson so Christopher Robin can be freed. Pooh and all his friends will soon be discovering lessons of self-sacrifice, sticking together, and working with single-minded determination as a group to overcome problems. 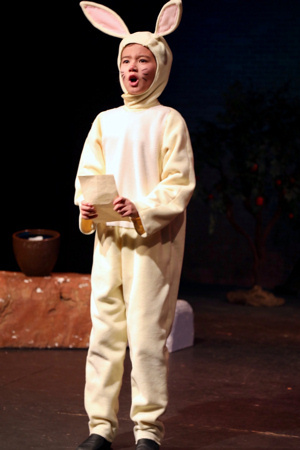 Pooh, played by Lilianah Barton, was sweet, cuddly and unambiguous, exactly what you want in a stuffed bear pal. 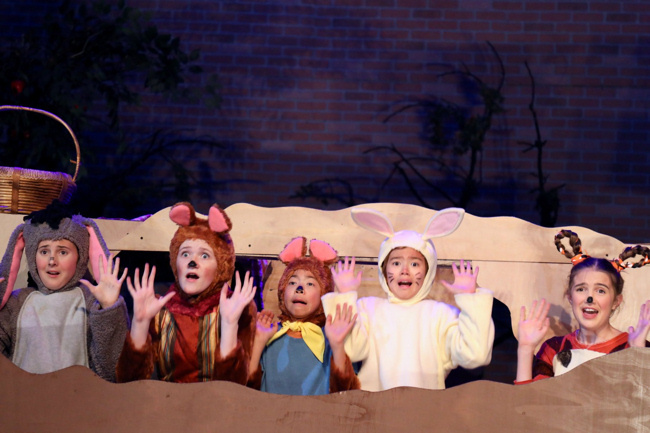 Standout performances came from Mira Keller, the interminably pessimistic Eeyore, Rahland Keller as the Owl with all the answers and a somewhat haughty attitude to match, Lexi Sexton as Rabbit, and Tess Hubbard as Tigger, the ADD tiger that Disney portrays with a springy tail and a slightly endearing lisp. Of course, if Tigger isn�t memorable, then we do have a problem. 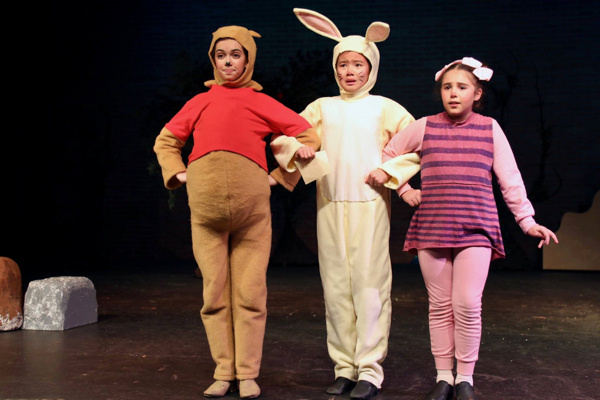 Piglet, Pooh�s never-far-away best friend, was played by Mimi Vizzi in a very cute, endearing role. Kanga (Lexie Palmer) and her child, Roo (Ethan Kuwata), looks right at home jumping through the forest and bush, and the slightly pompous Owl, always solemn and thinking ahead of all decisions, is really a good egg, loyal and true. The Bees, who ultimately help Pooh get his honey, are flashy and always in flight with the help of the Narrators. And the downcast Eeyore, in typical practicality, was having better than a gloomy day, after all. Anne Gesling and her crew pulled out all the stops�and the fur and feathers�to create instantly recognizable full-body costumes with intricate face makeup. 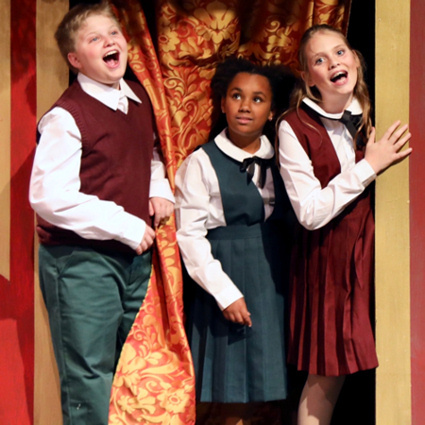 Kids in the audience were also riveted by the colorful set design and props by William Wilday and Mickey Blaine. Every actor had spot-on characterizations of their respective roles, which is no small feat in that odd, quasi-British world that is Pooh. 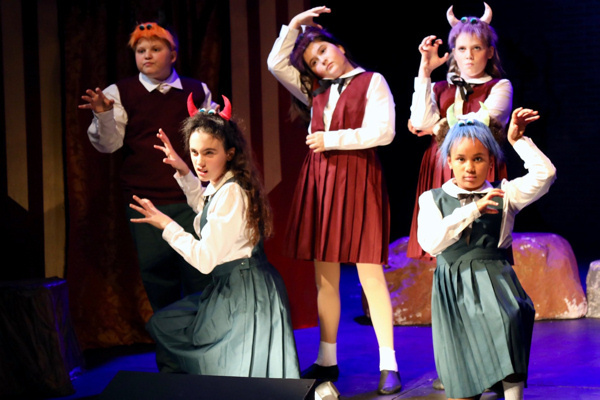 The show has all the warmth and comfort of a big bedtime storybook, so even your littlest ones will track with it. Lighting, Technical and Sound Design is also by William Wilday and Stage Management is by Viviana Gonzalez and Rolin Weber. Photography credits to Miriam Billington and Cori Goldberg. 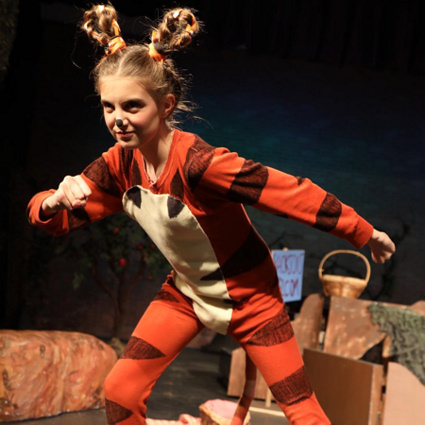 As Tigger would say, the show is �flouncy, bouncy, trouncy, bouncy�fun, fun, fun, fun, fun!� And the thunderous applause confirmed it. 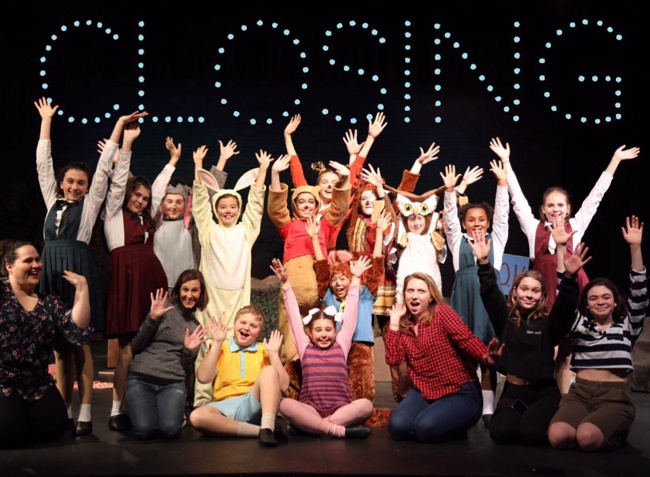 Congratulations to Morgan-Wixson�s youth program for a sensational, eye-popping production!